We interrupt this work day to inform you that www.leighbrescia.com is live. I’m not going to even go into the headache that was designing and uploading this thing: how many designs I went through, how many software platforms I tried before I could get it to work, the time spent on the phone with troubleshooters who were no help to me at all. . . . I gave up on the traditional software/uploading and finally decided to design a site in SproutBuilder since I’d had so much success with it before. Yay for beating the system! 1) I hope you stop by. 2) I hope you like it. 3) I hope you’ll let me know if you come across any incorrect/dead links. Since I am a one-person show (on my good days I’m actually a writer: not a graphic/website designer or HTML expert) there’s a good possibility that I’ve overlooked something. There’s a link to the book trailer, and an audio excerpt of me reading from One Wish (though I really don’t care if you skip that, because I’m not too thrilled with the way I sound on recordings . . . I can only hope that I don’t sound that way in real life). Meanwhile, the next time I need a website overhaul I’m going to the professionals. Lesson learned. A few things on this beautiful Monday morning . . .
1. It’s already a sunny 72 degrees outside (the high for today is 90). I am *loving* it! 2. I am surrounded by boxes. We are packing and moving into what will be our first house. More rooms, more storage, windows that open . . . I’m v. excited. 3. I had a great release week; now it’s time to get back to work. (Those of you who pre-ordered from Amazon: do not fret! Orders will begin filling soon!) I’m kind of torn at the moment. Though I haven’t even finished revisions on my last WIP, I’ve already decided to write a new book this summer. The problem is I don’t know which story to tackle first. There are two novels I’ve previously written that I want to re-write, but this weekend I got an entirely new idea. 4. The new idea would be an urban fantasy, which I’m intrigued by but obviously a genre I’ve never written. My characters (though unnamed) are already carrying on conversations in my head. I’ve started researching the subject a bit. I’ll have to make a decision soon: work on my previous projects or see if I can do something with the new idea. 5. It would be nice to clone myself. I’d send one of me to pack boxes, the other me would grade papers, and I could finish revisions and get to work on my new project. 6. I’m having serious website issues. It will be a while before I get it up. (Would be great to have a fourth clone to handle the headache that has been designing and uploading my web presence). 8. And finally, I stole this from Tina over at the Buzz Girls Blog, because *everyone* should stop what they’re doing at least once a day for a song and dance break. I’m not going to go all sap on you today, but I have to say, when I was sitting on the floor of my apartment, writing out the first draft of One Wish (longhand, in a 5-subject notebook—what?) I didn’t really think I would ever see the day when it was actually published and heading out into the world. 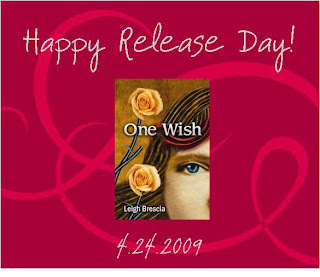 Pinch me now, because the pre-sale link disappeared from Amazon yesterday, and One Wish is officially on sale. First, I have a book trailer. It’s not as awesome as Cindy Pon’s, though (Congrats to Cindy on her Meg Cabot shout out yesterday! Link to the trailer in her post: http://www.megcabot.com/diary/?p=711). Anyway, this is something I did myself with my measly little Microsoft Movie Maker (which kept shutting down on me every time I made a change. Grrr). If nothing else, watch it to hear an excerpt from Greg Maroney’s “The Reluctant Ballerina.” Greg is *such* a talented pianist and composer, and I *heart* his music. Next, remember all those Debs posts? That’s for our blog tour. Now it’s my turn! Each week I’ll post a new list of links that will (hopefully) take you to an interview. You’ve got time-wasting material until the end of May, people. Use it wisely! Happy Release Day, C. Lee!!! And . . . I hope YOU have a Fabulous Day! P.S. www.leighbrescia.com is coming soon, I swear! I’m a one-woman show. Hopefully in the next few days . . . fingers crossed! Two things. . . .
First, thank you to *everyone* who has pre-ordered One Wish. I woke up this morning to my best Amazon ranking ever: 10,009, and I have been dancing around the house ever since! If I break 10,000 I just might faint. Comment for your chance to win a copy! Today I’m posting a link to an interview. It offers a bit of insight about me, One Wish, and my personal writing process. Also, find out what career path I *would’ve* pursued had I been able, and how I really feel about pantyhose. Thanks, Heather, for a fabulous interview! Readers: Stop by Heather’s blog for more author interviews and YA book updates. Comment often! Warning: This is launch week! Prepare yourself to be inundated with links to other blogs as I make my rounds on the 2009 Debs Blog Tour! Hope you’re having a great Monday! Deva Fagan is on the Blog! Deva Fagan is here today! Deva is celebrating the release of her novel: Fortune’s Folly. Ever since her mother died and her father lost his shoemaking skills, Fortunata has survived by telling fake fortunes. But when she's tricked into telling a grand fortune for a prince, she is faced with the impossible task of fulfilling her wild prophecy-or her father will be put to death. Now Fortunata has to help Prince Leonato secure a magic sword, vanquish a wicked witch, discover a long-lost golden shoe, and rescue the princess who fits it. If only she hadn't fallen in love with the prince herself. . . .
Deva likes searching for patterns, which is how she explains both her degree in mathematics and the echoes of old fairy-tales in her stories. She also loves tea, gardening, and playing the fiddle. She lives in Maine with her husband and her dog. Me: Without giving away too many spoilers, what is your favorite part of the novel/what was the part you had the most fun writing? Deva: I had a lot of fun describing the horribly ugly shoes my main character's father creates after he's lost his talent, with all their weird tassels and curling toes and mis-matched colors. Me: (lol) That sounds pretty wild! What kind of writing project are you currently working on? Or, if you aren't working on anything new, is there a different demographic/genre you wouldn't mind tackling in the future? Deva: I'm currently working on the first draft of a science fiction novel involving ancient aliens, spaceships, circuses, and exploding chocolate. Me: Wow! That sounds both complicated and fascinating! You have an incredible imagination! And finally: who is your writing hero and why? Deva: I have many, but one of them is definitely Lloyd Alexander, who I admire both for his magical, engaging, adventure-filled novels and for the humility, humor and kindness that comes through in his interviews and essays. Deva will be chatting with Carrie Ryan tomorrow at: http://carrie-me.blogspot.com. Thank you so much for stopping by, Deva! Okay, I have a confession to make: I think I’ve developed a serious married girl crush on one of the most obnoxious and snarkiest men on TV. I’m not sure how it happened, really: one minute I was rolling my eyes and the next . . . BAM. Simon Cowell, I think I *like* you! Sure you’re rude and offensive (though I have to admit, honest and usually right). I think you’re lacking in tact and prudence, but when you smile. . . . I think it may be the accent. The accent and the smile. I guess because his overall TV demeanor is so surly, it makes me appreciate the times when he is genuinely surprised and complimentary (and smiles). I must cherish those moments: they are few and far between. It happens on the following video clip, though. If you haven’t seen Susan Boyle’s Britain’s Got Talent audition: you *must* watch. The best part is the audience’s expressions before she sings. They are clearly not expecting much. Susan: You Rock, and Wrenn (One Wish) and I are pulling for you. I finally watched the Twilight movie this week. In one word: Amazing. In fact, I’d have to say that it has squeaked into my top five favorite movies of all time. The whole books into movies thing throws me sometimes. Generally, if I read the book first, I like it better than the movie version (Nick and Nora’s, How to Deal, etc.) but when I see the movie first and read the book later, I tend to prefer the movie version (i.e. A Walk to Remember, The Wizard of Oz). Twilight is probably the first book to movie I’ve seen where both the story and the movie version are equally appealing. I’d love the movie even if I hadn’t read the books, and well, I already think the books are fabulous, so no surprise there. Happy Monday! In honor of the release of her debut novel, Sydney Salter is here! You know the routine. . . .
Seventeen-year-old Jory Michaels wakes up on the first day of summer vacation with her same old big nose, no passion in her life (in the creative sense of the word), and all signs still pointing to her dying a virgin. In spite of her driving record (it was an accident! ), Jory gets a job delivering flowers and cakes to Reno's casinos and wedding chapels. She also comes up with a new summer goal: saving for a life-altering nose job. She and her new nose will attract a fabulous boyfriend. Jory survives various summer disasters like doing yoga after sampling Mom's Cabbage Soup Diet, enforced-mother-bonding-with-crazy-nose-obsessed-daughter night, and discovering Tyler's big secret. But will she learn to accept herself and maybe even find her passion, in the creative (AND romantic!) sense of the word? Sydney Salter held a variety of jobs before becoming a full-time writer, including her brief stint delivering pies and flowers, wrecking vans, and destroying wedding cakes in Reno, Nevada. Sydney now lives in Utah with her husband, two daughters, two cats, and two big Bernese Mountain dogs. She loves reading, writing, traveling, and, of course, baking and decorating cakes (but not driving them anywhere). Sydney: I had fun writing the romance--my poor character fumbled and embarrassed herself so many times! Me: Haven’t we all! What kind of writing projects are you currently working on? Or, if you aren't working on anything new, is there a different demographic/genre you wouldn't mind tackling in the future? Sydney: My first middle-grade novel, JUNGLE CROSSING, comes out in September. I'm also working on another YA novel. I hope to keep writing middle-grade, tween, and YA. I've given up on picture books--I'd rather write 50,000 words than 500. Me: I hear you. I didn’t do so well on the picture book end, either. And for the final question: Who is your writing hero and why? Sydney: Madeleine L'Engle. Not only did she show impressive persistence in her writing career, she had a wonderful marriage and family life. Thank you so much for stopping by, Sydney! Since I’ve been trying to heal sick people (and then myself) this week, I’ve no time for a fun, witty entry. Instead, I’m posting something from my WIP (which is titled, and in the revision stages). Meet Jaden and Parker: they’ve been assigned to work together on a project for their English class. Needless to say they’re not getting along very well. I stared at him in disbelief. What? Who is this guy? I thought to myself. I looked at him, taking in everything—the black shirt and jacket, the dark hair—either brown or black—I wasn’t sure because it was gelled in the front, and still had that “wet look” to it—and his piercing dark eyes. There was something strangely familiar about him—his strong jaw line and the few, tiny freckles splashed across his nose. Suddenly I realized: Parker Whalen was good-looking. Hot, even. “Are you saying that you typically do projects on books you already know about?” he asked. “I was just suggesting that if we picked a book we were already familiar with then this project might not be so complicated. We’d at least have some vague idea of what we were doing.” I skimmed through the list of titles. I ignored this. “How about Pride and Prejudice?” I suggested. “Why not?” I demanded to know. “You don’t know that,” I muttered. I tossed my list on the table in front of him and threw my hands up in exasperation. “Then why don’t you start naming books that you think I haven’t read and we’ll go from there?” I sat back in my chair and folded my arms across my chest. This was getting ridiculous. Picking a book shouldn’t be this hard. “Wuthering Heights is not a romance,” I interrupted. “That depends on how you look at it,” he replied, shrugging his shoulders. “Yeah, it’s a romance; because Heathcliff’s undying love for Cathy didn’t make him completely depraved.” I rolled my eyes. “Mr. Darcy is a gentleman,” I explained. “Mr. Darcy is a narcissist,” Parker replied. So you know: they finally pick a book and start working on their project. Drama ensues.